Express your love of the majestic mountains or the great northwoods with a sign that says so! 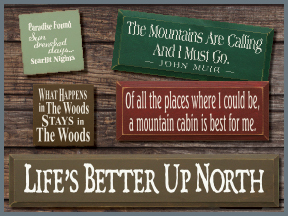 Whether it's a sign for your weekend cabin, or a year-round home, we have a variety of mountain signs and signs for up north to celebrate your little slice of paradise! With over 40 colors to choose from, your solid wood sign from Sawdust City will look great anywhere!